Stephen Baxter. Pic by PressEye Ltd.
Crusaders manager Stephen Baxter is backing his squad to maintain the mindset and momentum to continue to challenge across multiple fronts. Experience of past progress over cups and leagues offers Baxter extra help towards juggling a demanding fixture list which this season has presented tests home and aboard. Baxter appreciates certain similarities between the rise over recent seasons of Crusaders compared to the current development of Glenavon ahead of a weekend clash in Lurgan between the clubs sitting, respectively, second and third. 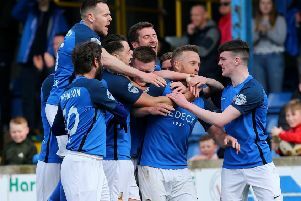 A Glenavon win would place the hosts level with Crusaders on points in the two teams’ pursuit of Danske Bank Premiership leaders. However, Baxter - drawing on experience of previous campaigns - is refusing to add extra pressure on his players within a packed programme. “We came out of November having played a lot of football over a number of different competitions and it is going to be the same this month and the other side of the New Year,” said Baxter. “It comes at a cost, at times, when you lose key players because of injuries or issues developed over those demanding schedules but that is part and parcel. “We have been able to produce this season in big games but, really, the only way to look at a campaign is by dealing with the next fixture on the list. Baxter, however, admits admiration for Glenavon - but not surprise. “They have quality players and, in the same way we had the label of a cup team for years, Glenavon have achieved success in that way and now the next step is consistency over the league,” said Baxter, who last night secured the signature of former Finn Harps midfielder Jonny Bonner, with the player eligible from the New Year transfer window. “Both clubs have pretty much the same records so far this season and evolution is measured for all teams by the ability to achieve consistency. Glenavon’s preparations for the high-stakes Mourneview Park meeting have taken place within the disruption of the winter weather. Lurgan Blues boss Gary Hamilton accepts his lack of control over the elements but is keen to see Glenavon return to competitive commitments in the aftermath of Saturday’s postponed trip to Cliftonville. Crusaders survived the snow to see off Warrenpoint Town - with Coleraine stretching the lead in top spot to nine by beating Dungannon Swifts. Glenavon hold additional opportunities to gain ground on both clubs but Hamilton admits it is a case of working around the weather. “It is difficult preparing for games given the weather as it impacts on our training pitch as well as fixtures,” said Hamilton. “So the boys are doing some spin sessions and gym work to keep ticking over. “We couldn’t do anything on Saturday with the match called off so this week has been about working around conditions. “We can only prepare as best as possible but it is the same for most of the clubs. “The blank date has hopefully allowed some to get over knocks and reach a point closer to free of injury. “We have Andrew Doyle and Mark Sykes out for Saturday so that double loss is a blow. “Bar Coleraine and Crusaders then everyone has been in the same position. “The games have to be played at some stage anyway and with our realistic target still Europe then we just look to put as many points on the board as possible.